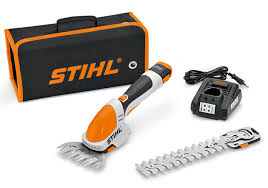 Now available Stihl's new cordless scrub shears with scrub cutter to trim and maintain small, evergreen hedges and small leafed ornamental trees with up to 8mm branch thickness. With a grass trimmer for cutting grass edging around the patio, flowerbed and edges around the house. Ergonomic, rubberised handle, double stroke blade for a powerful cut and low vibration. Includes textile carry case for neat storage, 2 high quality cutting blades, Battery and charger that fits the HSA25.